Can I remove a category on a WordPress blog post? 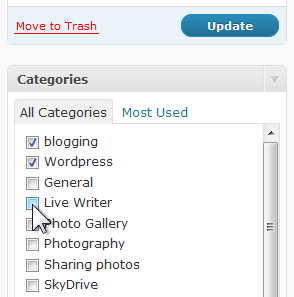 The category and tag links on WordPress blog posts provide a quick way for readers to find related articles. More than one category can be shown on a post. If you posted with a category that you later decide is not appropriate, is is easily removed or changed. 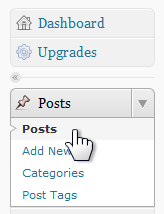 Sign in to your WordPress Dashboard. On the left find the Posts link. Click on it to expand the menu. Click on the next Posts link. This will bring up a page listing your posts. Move the pointer to just below the title of the post you wish to modify. This makes several option links visible. Click the Edit link. The Edit Post page comes up with that post loaded. Over on the right side, you may have to scroll down a bit, find the Categories listings. Note that the currently assigned categories show a check mark in the box in front of the category name. To add a category just click the box or category name you wish to add. Similarly, click on an already checked category to uncheck it. Click the Update button. Now only the checked categories will show for that post. You can even add a new category right on this page. There is an Add New Category link right below the categories listing. This entry was posted in Blogging, WordPress and tagged Blogging, categories, changing catergories, removing categories, WordPress by Ludwig. Bookmark the permalink. Be sure to click Update when editing a post. Similarly when making changes in Settings – Writing make sure you click Save Changes. When I checked you blog I did not find any posts. Thank you for quick reply! Althou I figured it most out myself already. Turned out I managed to remove “Uncategorized” category and had only one “Russian” left instead of it. That’s why could not remove it. Recreated “Uncategorized” and than was able to remove “Russian”. 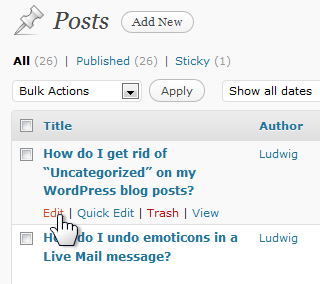 Same was for writing to default category – after recreating “Uncategorized” changed to it as a default. Blog is under construction – post about ultra running will be made in a few hours! Thank you for concern and help! Ah, yes! It should have occurred to me to mention that you must have at least one category. Do remember that you can change “Uncategorized” to another word.